Dual Mount 31.5-inch x 20.5-inch x 10-inch Deep Welded Single Bowl Kitchen Sink in Stainless Steel The Glacier Bay Dual Mount Stainless Steel 31.5x20.5x10 Single Bowl welded Kitchen Sink is sharp and sleek with a contemporary design. 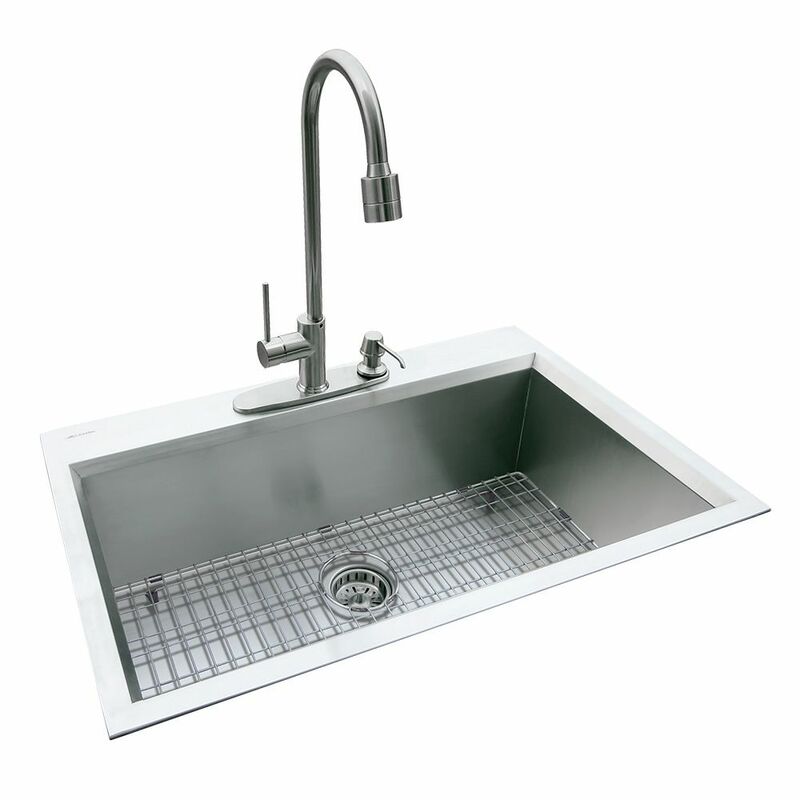 Durably handcrafted with 18-gauge premium 304 series stainless steel, the multi-layer undercoating significantly reduces noise when the sink is in use and prevents condensation. The stainless steel design complements many decor styles and the flexibility of either top or under-mount installation allows for simple integration into your kitchen design. Easy to install with mounting hardware included. Limited Lifetime Warranty. Dual Mount 31.5-inch x 20.5-inch x 10-inch Deep Welded Single Bowl Kitchen Sink in Stainless Steel is rated 2.7 out of 5 by 9. Rated 1 out of 5 by Lovemybirds from Looks nice in the store We bought this sink nearly two years ago and have fought with it every day. 1. We had to completely reinforce the tap area underside so it would be sturdy enough to hold the tap. 2. The strainer comes in two parts and is constantly plugged. We cut a couple of rays out of the first strainer basket and it helped just a bit. We are just changing the strainer basket with another two piece model that seems to have less rays and perhaps a better design. The sink scratches very easily; the square corners are hard to clean and we have to squeegee it to clean it. Rated 1 out of 5 by Matt from Not compatible for garberator Sink is not compatible for garbaraor. Sinks scratches very easily. Would not recommend it. Rated 1 out of 5 by swifty from Terrible sink Sink looks nice, thats all. Easily scratches. You have to throw away the basket it comes with as it is absolute junk! Cheap and poorly made harware. Don't waste your time and money on this! Horrible quality! Rated 4 out of 5 by lindsay from Gorgeous but shows dirt too easy I love this sink, it is exactly what I wanted (a deep, single basin top mount with the same footprint as my old double bowl) and it looks just gorgeous but I am a little annoyed that it shows dirt really easily (within the first day you could see flecks on the sides). It's almost like it needed to be made of the fingerprint-resistant stainless steel that you find on appliances now. I will have to wipe it down more often than I'd like but am still happy with it overall. Rated 3 out of 5 by Miles from Looks great but won't work with the supplied parts First and foremost throw out the strainer and basket that come with the sink and buy a replacement Kohler Duostrainer. The items that come with it are not properly designed an have 3 major flaws. 1. If you have the sink strainer pushed to close and pour a quick splash of hot water in, it will pop open when the sink bowl itself pops from the excessive heat in one location (the sink popping is an issue but only with very hot water and not enough for me to complain about). 2. The strainer drain is built in two pieces and sandwiches the sink in between it. This means it has two layers of drain straining and get your ice pick ready to start poking food through both layers. 3. The bottom strainers drain holes are more to the outside, these holes then get covered by 50% because the tail piece which connects to the bottom has no where else to go. So anything the size of a small pea or even the smallest slice of onion peel will take you an insane amount of time to clean out. To be fair I'm happy with the sink NOW and in future it would be within Glacier Bays best interest to not supply the basket at all as it's still very competitive without it. Rated 5 out of 5 by Jess4 from Just what I wanted! I had to get a drop in sink because my countertop is laminate and there wasn’t many choices out there so I picked this one… I am very glad that I bought this one as it has the perfect look that I was going for very unique and restaurant style feel! Rated 4 out of 5 by EJ Prop from Impressive look I just installed this sink and thought i would share some views, first of all the sink looks great. It makes quite the statement! The only thing that was a challenge were the "top mount" clips, they are a poor slot design that only a butter knife could fit, I had to fab a custom magnetic socket with a thin slot bit to tighten the clips. Now i have to warn any DIYs-er that if you have anything smaller than a 36" base cabinet "GOOD LUCK"! I installed this sink in a 32" cabinet and it took hours to get 8 clips in. There simply isn't any room for your hand to slide up and hold the clips. Also there's a under cabinet "rail" on the lip of the sink which limits the counter area holding the sink to 3/8 of a inch, so your counter cuts have to be dead on or its new counter time :( That's it! I've had no answer to my previous question if the faucet is included, so I'll assume it's not. But which faucet is shown in the photo of the sink, as I'd like to get the faucet too. Or, what faucet will work with this sink and the drilled holes? I bought this sink and ordered the taps online. You can also buy stainless caps to plug extra holes if you use single hole taps.